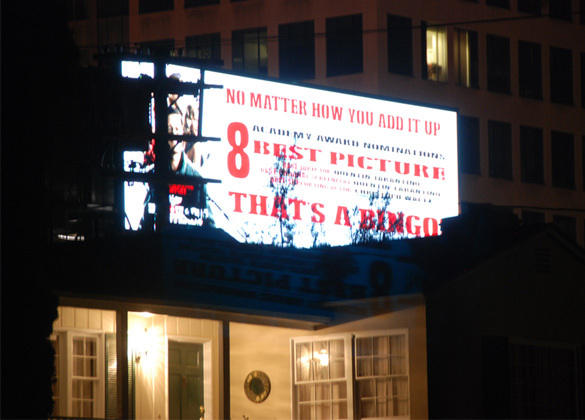 » Thumbs Down: Court’s Reaction to Billboard Company’s Plan for New Digital Billboards in L.A. Prior to hearing oral arguments today on Lamar Advertising’s lawsuit against the city, a three-judge panel announced that it had reached a tentative decision to reverse a lower court’s ruling that the city’s ban on new billboards violates the California constitution. The Appeals Court justices didn’t say when they would issue a formal ruling, but the fact that they had almost no questions for Lamar’s attorney during the oral arguments seemed to indicate that they had little doubt about their grounds for upholding the city’s ban. The legal saga that threatened to blow a huge hole in L.A.’s billboard regulations began in 2013, when national billboard giant Lamar sued the city after being denied permits to put up 45 new full-sized digital billboards in such neighborhoods as West L.A., Silverlake, Hollywood, and the San Fernando Valley. In 2014, L.A. County Superior Court judge Luis Lavin ruled in Lamar’s favor, saying, among other things, that the city’s distinction between business signs and billboards and other forms of “off-site” signs was a content-based regulation and therefore prohibited by the state constitution. At today’s oral arguments, deputy city attorney Michael Bostrom contended that the city’s off-site sign ban did not regulate a sign’s content, but only limited where signs could be placed. The legality of this kind of limitation, he argued, was established years ago by the U.S. Supreme Court, and upheld more recently in a number of cases before both federal and state appeals courts.